Underwater 360 video journey, cont. What a ride the 360 “spherical” video medium has been… I knew it would be awesome, but at no point did I realize the amazing family / community I would be adopted into by starting down this path. Although I wouldn’t consider myself one of the bleeding edge folks, the insanely early adopters, I was lucky enough to get out a bit in front of the herd thanks to some sage advice from a dear friend. Almost exactly 1 year ago, responding to a FB post, a kind and generous acquaintance (Elena from Scubaboard) offered up a loaner V1 360video housing system so I could test the waters so to speak. At the same time, I had been working with live streaming from underwater for ages, trying to come up with a way to stream without a lot of support crew (as in could just go out for a dive and live stream it to the masses) and was very close to completing my kit with full communications from Ocean Technology Systems. Facing a fork in the road, reach the masses, the non choir, the easily bored people on Periscope or continue my quest to immerse the viewer in the underwater world, utilizing what was being called the “empathy machine” of Spherical Video. As always, when faced with these kind of decisions, I reach out to my trusted advisors, and across the board they all said “VR is the future, live streaming with periscope will always be there and no one is racing you to that end, learn the 360 thing, learn to stitch, learn to shoot it, get good at it, get confident in your abilities “if you build it, they will come”. I railed against this advice for an hour or so, live streaming was (and is) the low hanging fruit, and I had just purchased a wifi extension to further the cause. Learning to stitch was not a walk in the park, even with the assistance of a mentor who let me practice on some of his very well shot GoPro array footage. It’s actually rather stunning how fast the stitching programs have improved between then and now. With updates to Autopano Video Pro and Giga, and rockstar plugins from the folks at Dashwood Cinema Solutions, it is a whole new ballgame. I’d like to preface the following discussion by saying that I’m still learning, my Underwater 360 footage has loads of room for improvement, but it is getting better thanks to the things I learned via trial and error and error and error. 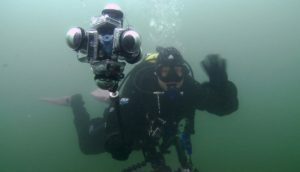 Just because you have an underwater system, good underwater 360 Video is not a foregone conclusion. By comparison I find topside to be a walk in the park. There are a few reasons for this, one simply being the environment. 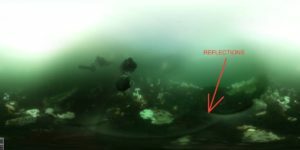 The reason 360 “spherical video” is perfect for the underwater world is also why it’s a bit of a challenge. That being the water. The water allowing us to move in 3 dimensional space, allowing us to float weightless, suspended in the green (or blue) can make your stitching more than a bit of a challenge (imagine a sphere, now imagine 2/3 of that sphere being featureless and trying to figure out a good stitch). Then there is refraction of light as it travels through air/water. You can’t just take a pile of GoPros in housings strapped together underwater and have it all just work out. Whyfor you ask? Well, as we learned in underwater photography 101 (the rules there still apply to video) when you shoot through a flat port (the term port in this instance refers to the window out which your lens is looking from inside its nice safe dry housing) you immediately lose some of your FOV (Field of View) your image is magnified up to 33% during its travels through air and water (the closer it is, the more magnification – this is why it IS possible to stitch with a perfectly aligned 6 camera flat port system underwater, but only if the subject matter is VERY far away – think a whale or something). So if you are aiming to use 6 gopro cameras that stitch swimmingly in air, you can see how each of them losing a good chunk of their FOV will make a stitch challenging if not impossible depending on the subject matter. (the wide angle view of the go pro cameras combined with their small size is what made them instantly useful for this application). If you look at the surfing world, you will see they get nice super wide angle surfing footage with some beautiful under/over and clear UW shots, but take a close look at the housings they are using. More often than not, if its not a flat port, it’s being shot with a BIG (for the camera system) dome, in the range of 6″ diameter or larger, and/or it is mounted further out on an aftermarket housing. The combination allows for great footage, often better than through the basic flat port with edge to edge clarity and less barrel distortion. There are a few after market ‘deep’ housings for scuba that employ this method. So what does this all have to do with 360 underwater? So you think ‘OK Laura, that’s great, so I just need to put some nice 6″ surfer style domes on my flat ports, and all will be well?” Sure, if you can fit them on the system without having to increase the size and distance between the cameras, because remember you still need the overlap for the stitch. This is where we start chasing our tails. Bigger domes mean bigger housing array. Bigger housing array (further apart cameras) mean need for more cameras for overlap. More cameras mean more of the bigger domes. You see where this is going, right? Dome ports also add the problem of light reflection on the edges, which means you have to take that into consideration when trying to figure out lighting for your subjects (out here in our chilly Emerald Sea, we don’t have the benefit of buckets of ambient light to work with) and also in stitching (you’ll want to make sure you have enough overlap to stitch inside any light reflection from dome port). Good enough meaning, how ‘in focus’ does the footage have to be to actively detract from the ‘wow’ factor of just being underwater. I wanted crisp, clear, beautiful underwater footage. I knew it was possible, in my incessant searching of the interweb, I found some epically beautiful footage of some dives in Green Island Taiwan, and then another batch from Japan. All shot with the original V1 360Heros H3SCUBAH6 with the small ‘snap on’ domes fabricated by Snake River Prototyping. (exactly what I was using) Of note even looking at the footage from current models, both KOLOR Abyss and the new V4 Abyss from 360Rize (formerly 360heros) I still have yet to see any perfectly crisp footage the rivals what the folks from Asia were sharing with the v1. So, curious about their secret sauce – there was reference to modifying the GoPros in one of the youtube comments – my dive buddy and I got to thinking that it must be a focus distance issue. Historically the occasional GoPro would show up with less than perfect focus, and there are more than a few DIY ‘fix your focus’ youtube videos. So maybe this was the secret sauce? Taking a wrench to your 6 GoPros? eeeeeeek! Luckily I’m a good eBay-er and had collected a bunch of cheap 3+ silvers and blacks to get started with (note to readers, the minimum you want to bother with is 3+ blacks so you have full protune and same same frame rate options) so I did not feel too horribly about potentially mauling my kit. This would not have been at all the same if I was taking a wrench to 6 brand new Hero 4 blacks (yeah, that experiment would not have happened). What the heck, i’ll give it a try. So i filled the bathtub up with water, and used one of the snap on lenses on a single housing and went to work trying to find some kind of focus. My logic was ‘if i can make it focus in the bathtub, it should work elsewhere’. At the same time I’d fired off an email to the gentleman in Taiwan, laying out that I’d figured it was a focus distance issue and asking him to confirm or deny that i was on the right track. People can be proprietary and a bit cagey about their methods to success and this was no different, but he came around and was very helpful. He confirmed I was on right path and that my numbers were within the range he also found successful. Now, I can already hear the rumblings from folks who coughed up the 5-6 grand on a new Abyss system not counting the cameras “but my focus is fine, i don’t know what you are talking about”. Is it? Is it -really- fine? When you look at it with a HMD (Head Mounted Display) as opposed to just 4k equirectangular is it truly equivalent to the Green Island youtube video with unmodified, stock out of the box cameras? If so that is something new as I have yet to see it, and I’d love to see your results. Even my favorite, and the best example I’ve seen to date of storytelling in the underwater world with 360video, The Click Effect is a little soft on the underwater shots, and that was done with ‘state of the art’ (at the time) gear. And yes, Click Effect is “good enough” but I believe it could be better. The fun and games didn’t stop there, I ran into another wee issue once the focus thing was somewhat sorted. Now, truth be told, if I’d spent the 5 and 6 grand on new housing, 2500-3000 on a set of GoPro’s, this last little bit wouldn’t have been an issue (they’ve henceforth solved this by making beautiful robust housing systems), but I’d also likely not have gone out on a limb with a wrench to mod my cameras, and learn how to maul GoPros, I’d be shooting with a fancy current model housing but likely still be less than satisfied with the focus and still be whining incessantly about it (but at same time defending it of course). The other issue came in the form of a tiny design flaw in the V1 SCUBA system. Flat glass (clear or orange filter) does not have the strength that an acrylic dome has (engineering 101?). I found that in the 70-100′ range, the little piece of flat glass in the snap on dome would implode, usually at the least opportune time. Oops. Reaching out to my new friend in Taiwan again, got confirmation that they had similar problem with their filters imploding at around the same depth. Easily remedied by finding a thicker piece of optically appropriate white float glass, luckily the size used matched some of the flashlight lenses that can be purchased for DIY projects. As mentioned at the outset, I’m not saying my Underwater 360 footage is perfect, not by a long shot. Someday maybe I’ll be able to afford one of the fancy new housings and a stable of GoPro Hero 4 or 5 blacks, or will have a project that has funding and can acquire one. Knowing what I know now, I won’t hesitate to modify my cameras for as close to perfect crisp focus as possible.